Home » ADMISSION FOR STUDY » ADMISSION FOR STUDY M.Sc and Ph.D » ADMISSION FOR STUDY. 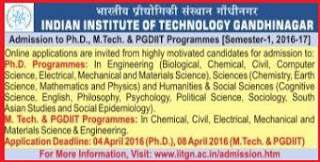 M.Tech » Gandhinagar » Gujarat » Indian Institute of Technology Gandhinagar Admission for M.Tech / PGDIIT / Ph.D Programmes for 2016-2017 Session. Indian Institute of Technology Gandhinagar Admission for M.Tech / PGDIIT / Ph.D Programmes for 2016-2017 Session. Admission Notice for M.Tech / Ph.D Courses - 2016-2017. M.Tech. & PGDIIT programmes in the Chemical, Civil, Electrical, Mechanical, and Materials Science and Engineering branches.